Wise approach to business structuring will help investor to optimize taxation and increase his capital. Proceeding with subject of investing into commercial touristic real estate, we would like to look in details at investment model for bigger and more expensive real estate object, such as hotel, with regards to foreign Investor. 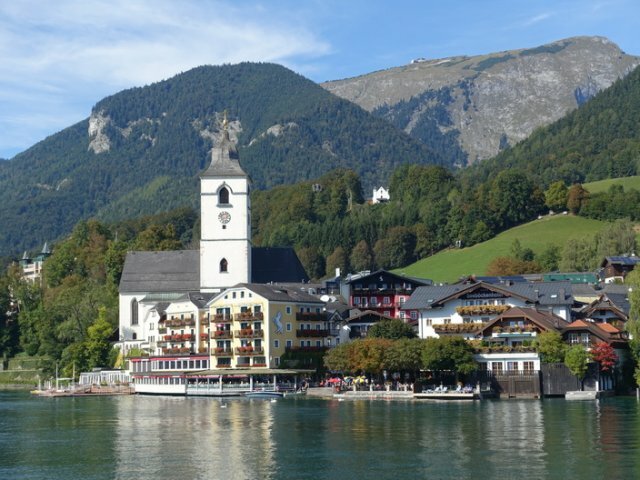 In our previous article we looked in details at benefits of investing into commercial touristic real estate in Switzerland or Austria and told about attractive from investment point of view Alpine region Gosau. In our last article we gave the example of investing into touristic Chalet. Proceeding with subject of investing into commercial touristic real estate, we would like to look in details at investment model for bigger and more expensive real estate object, such as hotel, with regards to foreign Investor. In this model, the Investor buys a hotel in one of Switzer­land's or Austria’s tourist destina­tions as a financial investment and leases this property on long-term to a hotel op­erator. By this method, the Investor gets undivided ownership of a high-value real-estate property without the restrictions and disadvantages of the Swiss "Lex Koller" law. This law normally puts strict limitations on the purchase of real-estate in Switzerland by non-resident foreigners. This is not the case in our situation. As a result, the investor receives a continuous cash-flow from the leasing rates of the hotel, while at the same moment his invest­ment is perfectly protected against inflation and geopolitical risk. The hotel operator, normally directed by a professionally experienced Hotelier, administrates and runs the daily business of the hotel, and pays the monthly leasing rates to the Investor. Hotel operator company can be established as a Switzerland legal entity in the form of "Aktiengesellschaft" (AG, limited liability company on shares), and the Investor should also become a (minority) shareholder of this operator company. This enables the Investor to additionally participate in the operating profits of the hotel, while still giving enough incentive to the Hotelier to man­age and run the hotel in a profitable manner. Similar legal entity can be created in Austria in accordance with Austrian law (GesmbH, AG). For reasons of tax optimisation and asset protection, the real-estate and the operating company's shares should not be hold by the Investor directly, but through a suitable investment vehicle like a Stif­tung or a holding company. This scheme is suitable for investment amounts from approximately 15 Mio. to 100 Mio. Swiss Francs (CHF). An annual return of 6 - 8 % on the invested capital is reasonable. In addition to this, long-term capital gains of the real-estate property can be expected due to development of economy of region or canton where property is located. The minimum time horizon to hold this type of investment should be at least 10 years. If properly chosen and managed, such an investment can last for generations. Project organization diagram is given below. It shall be noted that such countries as Switzerland have extremely restrictive laws regulating the purchase of residential real-estate prop­erty by non-resident foreigners. In Switzerland specifically, this law is named "Lex Koller", and it allows foreigners to buy resid­ential property only if they are willing to lease it for at least 182 days per year (so-called "Ferienlie­genschaften", holiday apartments) or if the property has a so-called "Ausländerbewilligung" (foreigner's permit). This restriction also applies to legal entities in Swit­zerland or Liechtenstein, like a Stiftung or holding company, if they are controlled by foreigners. A hotel is regarded as a commercial real-estate and as such the acquisition needs no special per­mission. The property can be hold in a holding structure like a Liechtenstein Stiftung. The real-estate owner may reserve a suite or some area of the hotel exclusively for his own use, as long as the overall operation of the hotel is not disturbed by this. Unlike office buildings, shopping centers or industrial real-estate, which in Switzerland or Austria require typical investment amounts of hundreds of millions Swiss Francs and which are mostly sold in the form of shares of closed-end investment funds or REITs (Real Estate Investment Trusts), the hotel investor has sole and undivided ownership of the property. This is an important factor, as the Investor alone can decide how to develop the property in the future, for instance, reinvest profits into a luxury renovation, build a new wellness area or what else. Also, there is an import­ant psychological aspect of this investment, because the investor really "can touch what he owns". It is also important that tourism business has been traditionally one of the most successful economic sectors in Switzer­land and Austria. Tourism contributes about 6% to Switzerland's GDP (Gross Domestic Product) and 9% to Austria’s GDP. Tourism is the third-largest economic sector after banking and health-care in Switzerland. Austria and Switzerland are top-level holiday destinations: its guests are demanding customers and willing to spend money for high quality and service. Swiss holiday resorts have been among the most fam­ous in the world since more than 150 years. Its hotel schools are regarded as the world's best, which results in a very high level of competence and professionalism for Switzerland's hotel managers and service personnel. Finally, the Investor gets a steady cash-flow from the hotel's leasing rates, while at the same time owns inflation-protected assets in one of the world's most stable economies and jurisdictions. In addi­tion to this, the Investor can reasonably expect that the value of his real-estate property will rise in the long-term, if the investment object was chosen prudently. In this investment model, we differentiate between the Holding company (in our case the Stiftung), which owns and leases the real-estate assets, and the Operating Company, which rents the real-estate prop­erty and does the actual business of running the hotel. This is a standard structure in European business and is widely chosen for tax and liability reasons. As the operating company carries the major risk of the business, an eventual failure of the business will only affect the - comparatively low capitalized - Operating Company. The principal asset, the real-estate property, will remain unaffected as it is independent from the Operating Company. To be really successful, a hotel in Switzerland or Austria must be run by a Hotelier, who personally identifies him­self (or herself) with the hotel's business and standard, and who fairly participates in the hotel's profits. A Hotelier is more than a mere hired manager, he must be a personality to give the hotel its unique identity and standing. Without this, the hotel is doomed for failure, or at least will not be among the best in its class. Countless examples in Europe's hotel history have proven this rule. On the other side, the Investor also wants to participate in the hotel's profits. His expenses for maintenance or improvements of the property are an important factor for the hotel's success. One com­mon solution for this task is to have a profit-dependant element in the leasing rate calculation. However, this has several disadvantages. First, the Hotelier might try to keep the operating profit low, so he must not pay a surcharge on the leasing rates. Second, higher leasing rates means higher fixed costs for the hotel in the future, which could be a problem should business temporarily dip down. 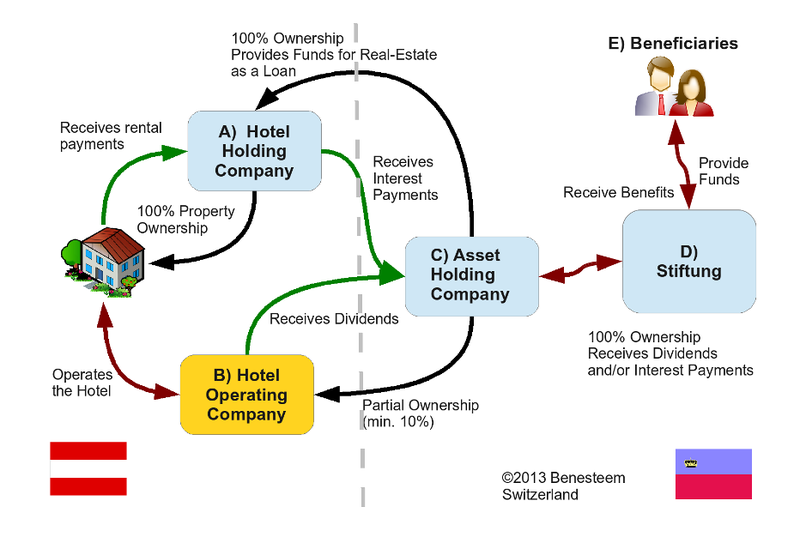 This dilemma can be solved, if the Investor also holds shares of the hotel operating company. These shares should be seen as a pure financial investment. The Investor should not be in­volved in the daily management of the hotel. But as a shareholder, he has a lot of super­vising and voting rights by Swiss and Austrian corporate laws. He can examine in detail the hotel's financial state­ments, take influence on the hotel's business strategy (if he wants) and vote on the hiring of important management positions. In an AG, the profits are distributed to the shareholders in the form of dividends. The amount of the di­vidends is set by vote of the shareholders assembly after each fiscal year, so dividends are paid from earned profits and this is a big plus. The Hotelier, on the other side, has his own shares of the Operating Company and by this is co-owner (or even majority owner) of the hotel business (but not of the hotel property!). In his position as general manager of the hotel, he is an employee of the Operating Company and gets a basic fixed salary, which can be freely set. In his position as a shareholder, he gets his part of the hotel's operating profit through dividends. This scheme provides an important element of motivation, as the Hotelier participates directly in the profits and effect­ively runs his own business. Corporate laws set very strict rules on bookkeeping and information transparency to the shareholders, so no major development in the business can go unnoticed by the Investor. On the other side, they provide highly flexible instruments for an Operating Company to do a capital increase, give parti­cipation rights to third parties (for instance to attract a famous new chef for the hotel's restaurant) or for corporate financing, should the need arise. A hotel operating AG has a little bit more administrative overhead and additional expenses for incorpora­tion, bookkeeping, auditing etc. than a simpler corporate structure. However, its advantages, as ex­plained above, by far outweigh these drawbacks on the long term. Like all large investments projects, a direct investment in commercial real-estate requires careful prepara­tion and comprehensive analysis and planning. A real-estate property cannot be bought today and sold 3 weeks later on the stock market, like anonymous shares of Nestlé. Planning and implementing an investment like this require experts from the fields of corporate law, inter­national tax law, real-estate, tourist business and investment banking and management, as well as a central steering institution to coordinate and direct the activities of the individual expert partners. Wisely chosen consulting company, as Benesteem Executive Consulting Service, is able to not only provide analytic and invest­ment management know-how, but especially act as a central coordinating institution on behalf of the Investor. Generally, the project can be divided into the 3 periods of planning, implementation and operating. Planning includes development of business plan, macroeconomics analysis and choice of region, microeconomics analysis and choice of suitable property object, management requirements analysis. At second stage all the necessary legal entities are created. They include Holding (Stiftung) and Operating company. Real-estate acquisition and negotiation of employment contract with Hotelier also takes place during this stage. And finally, the last stage of project involves operating activities and management of real estate. The goal of described investment model is not only satisfying interests of all parties in the project (Investor, Hotelier) and effective operation of the project as a whole, but also taxation optimization. 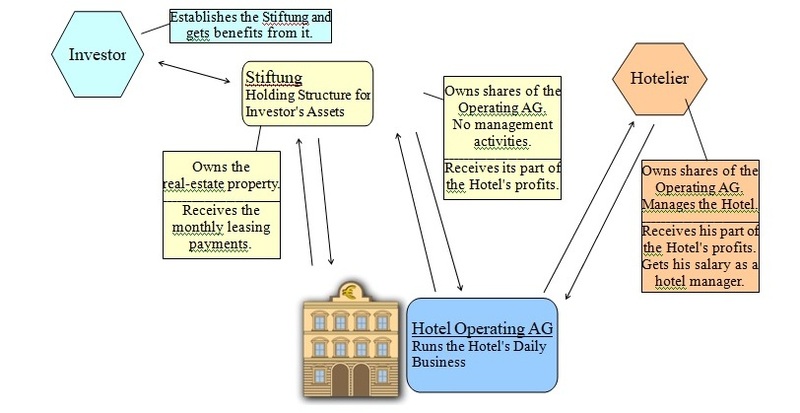 Diagram below demonstrates an example of business model for Austrian hotel, which is organized into the structure that allows reaching maximum cross-border optimization of taxes, as some elements of structure located in jurisdiction of Austria and some in Liechtenstein. Such structure that seems complicated at first sight, in reality will help not only save investor’s money but also increase his wealth. A) Hotel Holding Company: founded in form of legal entity under Austrian law (GesmbH, AG). It is a 100% owner of real estate and receives rental payment. Net rental income is taxable under Austria corporate income tax ("Körperschaftssteuer") at 25% flat rate. However, funds for real-estate acquisition had been provided by entity "C" as a loan. Interest payments on this loan are fully tax-deductible as expenses for "A". ETR on rental income will be in the range of 1-2% (for that part which is used for loan amortisation and dividend payments). Interest payments to Liechtenstein Holding (entity “C”) are exempt from Austrian withholding tax. B) Hotel Operating Company: founded in form of Legal Entity under Austrian law (GesmbH, AG) and is partially held by entity “C” (minimum 10%). It is aimed at hotel management. Dividend payments to Liechtenstein Holding (entity “C”) are exempt from Austrian withholding tax, if holding holds a qualifying minority. E) Beneficiaries are final recipients of profit and provide assets. Distributed benefits must be taxed according to the personal income tax rules of that jurisdiction, where the benificiary is tax-resident. Accumulated wealth, which stays in entities "C" or "D", cannot be accounted as a personal income (exception German and GB tax residents) and remains tax-neutral. If a real-estate property is sold in Austria, a real-estate profit tax of 25% ("Immobilienertragssteuer", §30 EStG) on the effective profits is due. The effective profit is calculated as the difference between the total purchase and/or construction costs plus an annual allowance for maintenance. Example: Purchase Costs 10 Mio. EUR, sold after 10 years for 15 Mio. EUR, maintenance allowance 100.000 EUR per year. Effective profit: 15 Mio. - 10 Mio. - 10 * 100.000 = 4 Mio. EUR. The 25% real-estate profit tax results to 1 Mio. EUR of taxes! In addition to this, a real-estate purchase tax ("Grunderwerbssteuer", GrEStG 1987) of 3,5% of the purchase price of the property is due in Austria. This tax is normally paid by the buyer, but as it must be paid from his investment funds, this tax reduces the maximum achievable selling price. Example: Purchase price 15 Mio. EUR * 3,5% tax = 525.000 EUR tax liability! But: In our model, the Asset Holding Company C) will be sold, not the real-estate property itself. This is a purely financial transaction, executed under the jurisdiction of the Principality of Liechtenstein, and is untouched by any Austrian tax laws. Under Liechtenstein law, capital gains profits from financial investments are generally tax-exempt, thus resulting in no tax liability at all! As it can be seen from models for investment into commercial real estate in Austria and Switzerland, wise approach to business structuring will help investor to optimize taxation and increase his capital. Are you interested in such type of investments or want to get more expert information on this issue? To do that you can use button “Ask the experts” located right below the article.